CocktailMom: Corie would be proud! My friend Corie came to visit in May from Seattle, WA and brought her scrapbook tote knowing we would be scrapping every night. Which I think we accomplished, ok one night slipped by to a bottle of wine. I was totally shocked that this tiny tote is what she uses at home to scrapbook too...it wasn't just the travel bag. 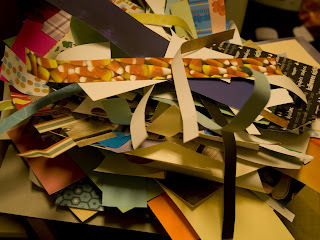 This idea of reducing my scrapbook supplies has just hung with me since May. I just can't seem to get it out of my head. And Corie did make fun of me a bit when she saw my "scrap stash". I am not a pack rat except for scrapbook paper. I don't know why, I have every intention to use every last tiny piece but because I put this pressure on myself I then am not inspired to crop. So....I did a major paper purge. I listed it all on freecycle and now some other scrapper is enjoying her new stash. And I am enjoying the very minimalist look on my layouts. I'm totally into the white space right now with accents. I know it's a phase but I'm really digging it right now. Thanks Corie for always being such an inspiration!